Taking part in a dog show can be great fun, but both you and your Labrador should be fully prepared. Teach your dog show manners, and make sure it is in prime condition, as it will be judged against a breed standard of ideal physical and personality characteristics typifying the “perfect” specimen. You will need a non – check show collar that permits the judge to have an unimpeded view of your dogs neck, and a slim lead about 1.5 m (5 ft) long. If attending a “benched” event, take a benching chain to secure your dog in its allotted space, as well as identification number clip. Your dog will travel best in a crate loaded in the back of a car. Pack food and water for your dog, along with its bowls. If you plan to picnic, also take refreshments for yourself. Folding chairs and a large umbrella for sun or rain protection are essential, as are plastic bags or a “poop scoop” to clear up your dog’s mess. A towel is useful for cleaning muddy paws. All supplies, including grooming equipment, should be kept in a designated bag. Visit shows alone first to see exactly what occurs. While working trials require dogs well – trained in obedience and a variety of specialized skills, kennel club events demand only beauty and personality. For these, your dog’s coat must be in good condition, its ears clear of wax, and the teeth tartar – free. Bathe your dog and clip its nails a few days before a show, to allow renewal of the coat’s gloss by natural oils. Use a conditioner only with the advice of experienced exhibitors. Remember, no cosmetic aids to improve a dog’s looks are permitted at show. A successful show dog has been trained from puppyhood to accept scrutiny from strangers. Reward your dog for permitting unfamiliar people to handle it a ring judge would – allowing the hindquarters to be touched, and the mouth to be opened and the teeth examined. Judges prefer dogs that are amenable as well as handsome. Young Labradors in particular often wiggle with excitement when touched. Create a show – ring environment at home, where your dog can learn to stand still while being inspected. Train with food treats – acceptable bribes in real shows. With maturity, most Labradors become calmer in the ring. A dog show is exciting for owners because of the hope of winning, and exciting for canines since it is an opportunity to meet many other dogs. However, by the time your dog is due to enter the ring, it may be bored, and bored dogs do not win prizes. Labradors revive instantly at the scent of food. Use favorite treats to keep your dog bright and animated while performing for the show judge. Showing your Labrador Retriever can be inexpensive, or surprisingly costly. If you show your own dog, your only expenses are entry fees, transport, and accommodation. At the highest levels on the show circuit, professional trainers and handlers are frequently employed. This can add a very considerable financial burden, and it is a rare dog that is so successful that handling costs are earned back in stud fees or puppy prices. 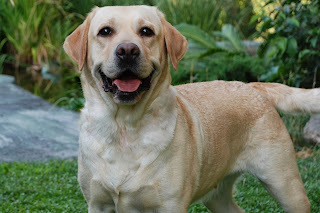 If your are not interested in serious exhibiting, a more sensible approach to showing your Labrador is to consider it a pleasurable pastime for both you and your dog.